This application assists retail companies to manage their business more effectively and more intuitively. With the ability to integrate into Eftpos, POS is a powerful extension to MYOB Exo Finance. MYOB Exo is easily configured to provide complete point-of-sale functionality. This means you can run your entire business, from end-to-end, on the same integrated system, with complete transactional visibility. MYOB Exo stock control capabilities translate to automatic updating of stock levels as sales are transacted, support of multiple warehouse sites, access to customer orders, delivery times and much more. Combine all of this with MYOB Exo POS easy-to-use retail interface, along with barcode reader, cash drawer, docket printer, EFTPOS, touch screen and other retail POS hardware integration and you can create a very powerful enterprise retail solution. 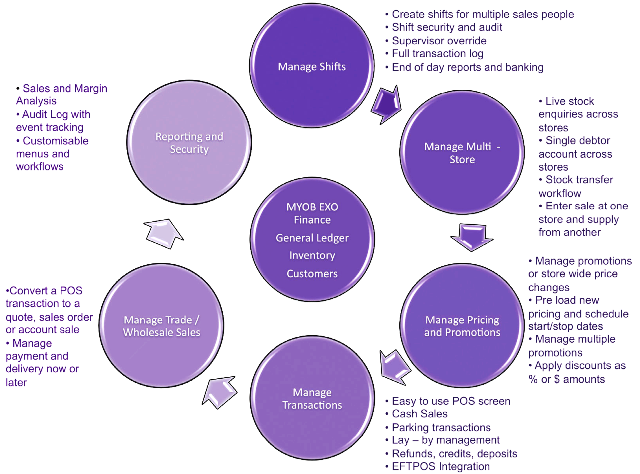 For further information please read the MYOB EXO POS factsheet.